WHEN PLAYING ANY KIND of music, hitting the right notes is only part of the challenge. You also have to be in sync (on the beat), especially when you’re playing with others. 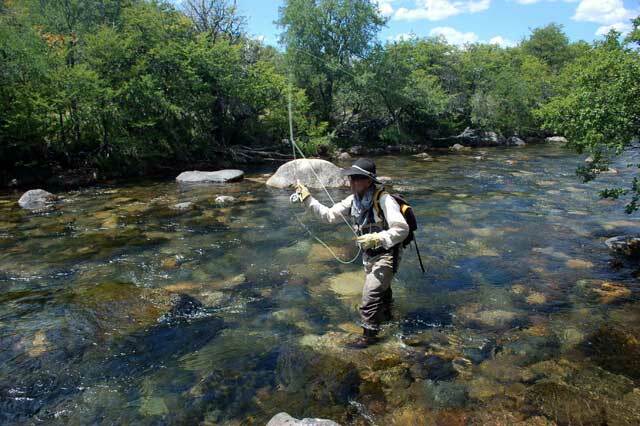 You can actually apply this thinking to your dry-fly fishing. People talk about “being in the right place, at the right time” often, but when most of us anglers cast, our entire focus is on where, and not enough attention is paid to when. We’re so wrapped up with aiming or placing the fly at that perfect spot in a run, that we lose sight of another key factor: timing. And as the fish are eating off the surface, I would say that when you cast is almost as important as where. Sometimes you can dictate when a fish eats, but they usually control the tempo. You’ve probably seen a situation like this unfold: Trout eats left… 10 seconds later, trout eats right… 10 seconds later, trout drops back in the run a few feet, and eats again… longer pause… then the cycle starts again, as the trout eats left. Of course, this doesn’t always happen the exact same way, but if you sit and watch trout eat, you’ll notice that patterns happen fairly often. Another mistake many of us make when we see rising trout is to rush right in with a cast without trying to discern a rhythm or tempo. I don’t know why some trout feed in rhythm. I’ve watched them from above the surface, and through a diving mask as well. Best I can guess is that a trout sees a bug and rises to eat that bug with a certain body motion (tilting up, quartering toward or away from the bank, and so forth) that leaves them in a certain position after they eat. Then the trout “re-sets” to feed from their new position. Sometimes that means they’re looking a few feet across the run; sometimes it takes them a few feet of drifting down current to re-set. Then they might go back to “home base” and start all over. What I do know is that tuning into the feeding rhythm (when it happens) is what separates a great dry fly fisher from an average one. A big brown is sipping on along the bank… it seems to come up every 14 seconds… fish rises, and you cast two seconds later… it often doesn’t matter if you make a perfect shot; that fish is not ready to eat. But then, fish comes up… you make your cast 12 seconds later… you find your fly in the right place, at the right time. Bingo. Next time you’re enjoying a great dry-fly hatch, take some time to really watch the fish. Once you’ve figured out what they’re eating, see if you can’t establish a tempo pattern. And if you can do that… see if you can jump in, right in rhythm. You’ll undoubtedly hook more fish.